If you’ve ever wondered if Bonita Springs real estate sells in the summer take a look at the “units sold” graph. This August was a record number of closed sales; homes, condos, land, manufactured homes and luxury homes and condos. 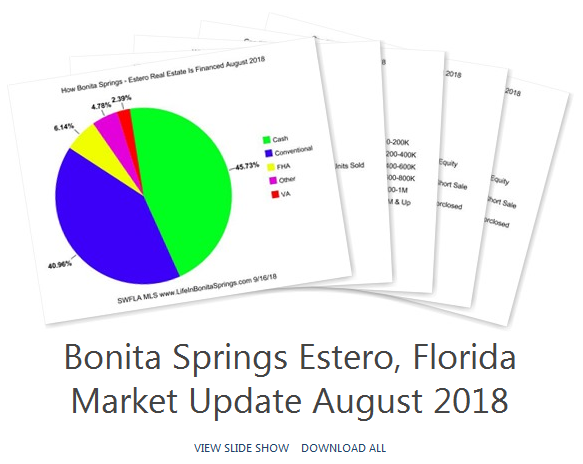 In short, those summer buyers, no doubt, were buying to over-winter in Bonita Springs and Estero, Florida. Rentals are in short supply and many folks are buying a few years earlier than their actual need for a property because they can’t find a rental. Due to healthy real estate sales the prices have been gradually climbing so we’re seeing and increase in prices and sell off of standing inventory. Even some of the most challenged neighborhoods are seeing activity. This is also increasing the conventional mortgage use. Cash transactions are only about forty-five percent of the market and conventional mortgages account for about forty-one percent of the market. Both short sales and foreclosures are few and far between. We see them occasionally but not very often. The foreclosures sell at market value and not below real estate value. Over seventy-six percent of the home and condo sales in the Bonita Springs and Estero, Florida area are priced under $400,000! That’s a whopper amount of sales in entry level. Only about 2.75% of sales occurred in the $800,000 and over price point. A sobering statistic if you own luxury real estate in the Bonita Springs area and you’re wondering why you are not getting showings or why it isn’t selling. If you have questions about the hyper-local real estate market in your specific neighborhood plan or on your street call or text 239-273-7430 so we can provide a drill down specific to your circumstances. The truth is in the numbers and we know how to crunch them!